Back in June, Cloud Engines said it was discontinuing its troubled Video product and offered to refund buyers' money or exchange for a Pogoplug Business version plus a copy of Pogoplug Premium Software. Today, to add an extra incentive to those who might be dragging their heels on helping the company to rid the world of its potentially incendiary devices, Cloud Engines today notified all Video owners that it will be shutting down service to all Pogoplug Video devices effective as of August 9, 2011 (next Tuesday). By now, you have hopefully heard that Cloud Engines, Inc. is recalling all Pogoplug Video units (Pogo-P11, Pogo-P12, Pogo-P13, and Pogo-P14) that it has distributed. We have received reliable reports that units have overheated, with flames possibly issuing from the unit in at least one instance. At the request of the United States Consumer Product Safety Commission, we will be shutting down service to all Pogoplug Video devices effective as of August 9, 2011. If you have not done so already, please safely eject your hard drives and unplug your unit immediately. Note that this recall does not affect any other Pogoplug products, including Pogoplug, Pogoplug Pro, or Pogoplug Biz. Pogoplug Video is all black, and is the only Pogoplug with an external 'brick' power supply. 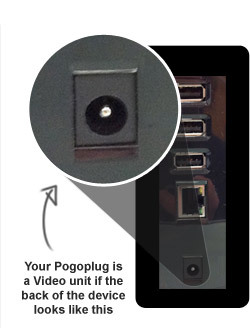 If the back of your Pogoplug looks like the image in the photo below, you own a Pogoplug Video unit. What should I do with my Pogoplug Video? We sincerely apologize for any inconvenience this recall may cause you, and want you to know that we are committed to delivering safe, reliable and compelling products. Thank you for your support and patience. If you are happy with and depend on your Pogoplug, we would be happy to ship a brand new Pogoplug Business ($299 value) to you, along with a Pogoplug Premium Software license ($29 value): total retail value of $330 . If you are relying on the video acceleration included in the Pogoplug Video product (not included in Pogoplug Business), please note that our Pogoplug Premium Software provides similar functionality. Pogoplug Premium Software turns your laptop/computer into a fully featured Pogoplug, with all the features (including fast transcoding) you enjoyed via Pogoplug Video. The only disadvantage to Pogoplug Premium Software is that you must leave your computer on for remote access, streaming and sharing. Please note that Pogoplug Business includes certain features (customized logo, auditing, multiple user accounts) that other Pogoplugs do not. You can read more about Pogoplug Business here: http://www.pogoplug.com/products-pogoplug-business.html. If you are interested in this exchange option, please record the device ID of your Pogoplug Video (listed on the outside of your package as well as on the bottom of the sled on your Pogoplug Video) and submit an Exchange Request here: http://videorecall.pogoplug.com/request. In any event, please safely eject all hard drives and unplug your unit. Finally, please note that if you choose to exchange your Pogoplug Video for our Pogoplug Business product, you will not be able to obtain a refund.